Trees in your front yard are great, but keep them on their toes! 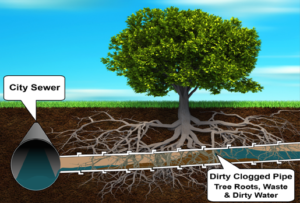 If you’ve ever had a back-up in your floor drains, or gurgling at your sink or toilet, then you’re probably aware of how damaging tree roots can be. 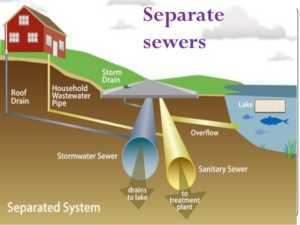 In Cleveland, the regular cleaning of your main sewer laterals (storm and sanitary) is highly recommended. 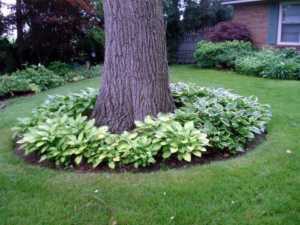 If you have a large tree(s) in your yard, especially if your home is older, please know that it can have a hugely detrimental effect on your drain system, especially your main sanitary and storm laterals. Your main laterals are the long stretch of pipes that run to the main municipal lines, usually in the street, or sidewalk. Older lateral lines are made of clay pipe, which are typically in 2-feet lengths that run from the street, to the foundation of your home. The connections were likely cemented together to create a tight seal, but over time, these seals begin to deteriorate, and tree roots seek-out the moisture to feed-on. Some tree roots are more aggressive than others (see below for a list), which either get inside the pipe, or wrap around it, causing them to “belly” or break. Regular maintenance on your main sewer lines, no matter what part of Cleveland you reside, is always a wise, cost-effective investment that will save you money, a huge inconvenience and a potentially ugly yard, due to a major excavation. The most effective cleaning methods are to snake or root-cut a line, using a high-pressure jet unit. The former is the more typical method, and can be done either from inside the home, or if there’s outside clean-out access, from the sidewalk. Plumbers will often use a “big machine” that has a ¾” diameter cable with a cutter that has varying sizes and styles, depending on the anticipated issue, which will travel 100-feet. We, at Advanced Plumbing & Drain, utilize knife and serrated cutters, most of the time. For sewers that may not have had consistent cleaning with a snake, a root-cutting apparatus using 2000psi of water to cut the obstruction-away is used. This is an extremely effective method to clean your sewer, however, it’s more expensive due to the equipment needed, which is a high-pressure sewer cleaning combination truck. At Advanced Plumbing & Drain, we have the experience, equipment and knowledge to service any pipe and drain problem to ensure your way-of-life remains in-tact! We have your back, Cleveland!! Call us at (440) 331-5555, or click here to send us your information to schedule service, or to receive a free estimate. Plus, talk to us about choosing the right home warranty plan to save you hundreds of dollars. Believe us, it’s worth it!